Do you have a black shirt? Have you ever seen black asphalt? These items appear black because they absorb all the colors. Scientists have found a black planet. 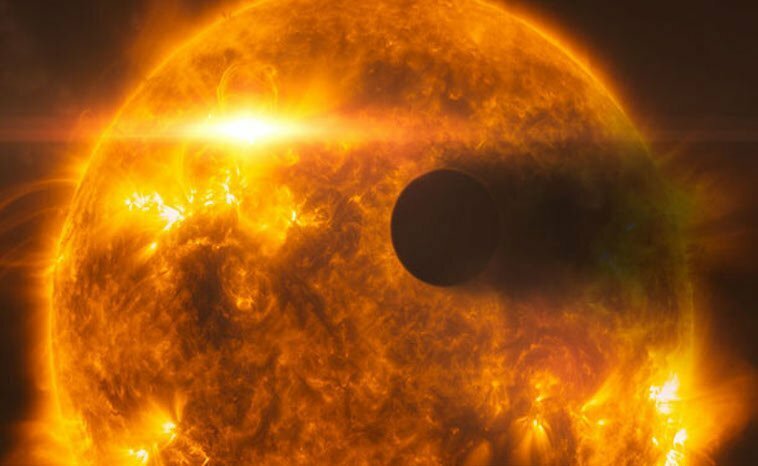 Read on to learn more about WASP-12B the black Exoplanet. 1400 light years away an exoplanet named WASP-12B orbits a Sun-like star name WASP-12A. Discovered in 2008 this exoplanet has become one of the most studied due to the fact it appears black. 3 How Dark Is WASP B12? A year of just over one Earth day. When NASA’s Hubble Space Telescope observed the planet it found that it appeared black. Presumably, they believe that absorbs light rather than reflecting it back into space. The planet traps 94 percent of the visible starlight falling into its atmosphere. The hot atmosphere prevents molecules from surviving the day side of the planet when temperatures reach 4,600 degrees Fahrenheit. Consequently, the clouds cannot form to reflect light back into space. Furthermore, the incoming light goes deep into the atmosphere where hydrogen atoms absorb it and convert it to heat energy. How Dark Is WASP B12? The researchers determined the planet’s darkness by using Hubble’s Space Telescope Imaging Spectrograph. They looked for the most visible light and for a tiny dip in starlight as the planet passed directly behind the star. As a result, the amount of dimming tells astronomers how much reflected light was given off by the planet. However, the observations did not detect reflected light, meaning that the daytime side of the planet is absorbing almost all the starlight falling onto it. What scientists do not know is why there are differences in similar exoplanets and their reflecting capabilities. As they gather more evidence and find new ways to look at these planets, they may find better explanations. We will continue to follow the research regarding these gas giants and hope to learn why some of them absorb and why others do not.